As much as you love your kid, filling the days with fun activities when you stay home can sometimes be a challenge. Fortunately, 3-year-olds make good companions who are generally up for anything, at least in small doses. Your 3-year-old's enthusiasm for new things can make even a simple excursion fun, and you don't have to limit yourself to traditional kid activities. You can find ways to make almost any outing fun with your young adventurer. To blow off steam, the neighborhood playground has numerous advantages; in some cases, you can walk there and you might find other kids -- and moms -- to make friends with. But traveling to the next town to a bigger or just different playground can provide a new adventure, since most large playgrounds have different elements. Local lakes or pools often have memberships for the summer and are often less intimidating than a large lake or ocean for a 3-year-old, although your little one might enjoy just digging in the sand at the beach. Amusement parks often have special areas for the younger set; many offer season passes that make it easy to drop in for an hour or two, time enough to have some fun but not so long that meltdowns from heat and crowds occur. Your 3-year-old can enjoy all kinds of museums or educational places, including art museums, the zoo, hands-on science museums, aquariums, natural history museums and antique car museums. If you live near a large city, the number of small museums run by individual owners might surprise you. Doll museums or hospitals and train museums might capture your little one's interest. 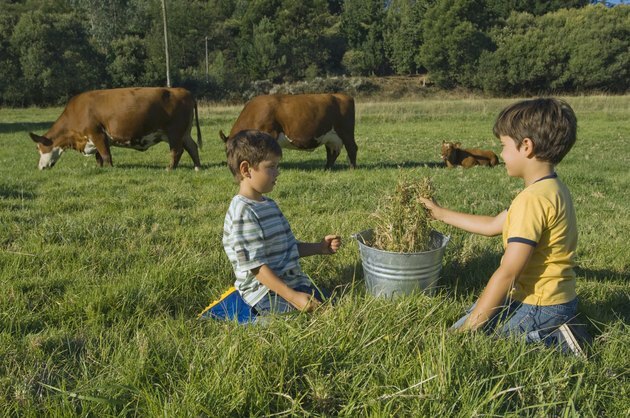 While you might feel like you're back in fourth grade touring the local dairy, it's all new and exciting to your 3-year-old. Many local businesses give tours or open their doors at different times of the year. Farms, orchards, riding stables, manufacturing plants and nurseries might offer a behind-the-scenes look. To have fun and get something accomplished at the same time, pick blueberries, apples or corn at a local farm. You can certainly take your 3-year-old to the toy store and let him salivate over toys, but you don't have to stick with the usual mall shops or big box stores to have fun shopping with a 3-year-old. Try the feed or farm store if you live in a rural area; at certain times of the year, they have baby chicks, ducks and bunnies to hold -- with you right there to prevent accidental squeezing, of course. Grocery shopping takes longer with a 3-year-old, but it gives you a chance to teach counting and colors and to explain why some foods are better for you than others. Give your child a calculator and let him add up your purchases; no, his addition won't be accurate, at least not at first! Buy some seeds at the nursery and plant them after hitting the local hardware store for a kid-sized shovel. When it's cold, rainy or too hot out, indoor play areas provide a new experience. Many are geared directly to the 3- to 5-year-old age group and feature climbing toys, ball pits, sandboxes, puzzles, large riding toys or dress-up areas, not to mention lots of potential playmates. Some play areas contain roller skating rinks, large slides or bounce areas. While indoor play areas charge a fee, most also offer season passes or have special times during the week where they offer reduced costs.